From every possible variation of a pair of denim to some seriously bizarre swimming attire, each fashion item that made headlines in 2018 was wilder than the next. While it’s unclear if anyone actually did wear these unusual designs, they made for excellent conversation starters, to say the least. Clothing brand PrettyLittleThing shared an image of its new “Green Metallic Asymmetrical Ring Detail Bodycon Dress” to Instagram, where it promptly divided followers with its half-bikini, half-bodycon construction. Described on the brand’s site as having “green metallic fabric with an asymmetric design, ring detailing and a bralette-style design,” the dress was somewhat more difficult for social media users to wrap their heads around. While a few praised the look, others were confused as to where one might wear this item of clothing and offered their own suggestions. Carmar Denim’s “Extreme Cut Out Jean” made waves on Twitter for its $168 price tag — and its wildly revealing look. The Los Angeles-based brand described the jeans as featuring a “relax fit, high rise” with “large statement cutouts on front and back.” Twitter users, naturally, had much to say about them. “Surely there are cheaper ways to look like an idiot?” one detractor mused. “If only those pockets included jeans,” another person joked. Crocs, the rubber slip-ons worn by gardeners and grandmothers around the world, quickly became a trendy fashion statement when Balenciaga debuted a platform version on the runway. When the clogs, complete with a 4-inch lift and pin embellishments, became available to purchase from Barneys for $850, they sold out within hours. 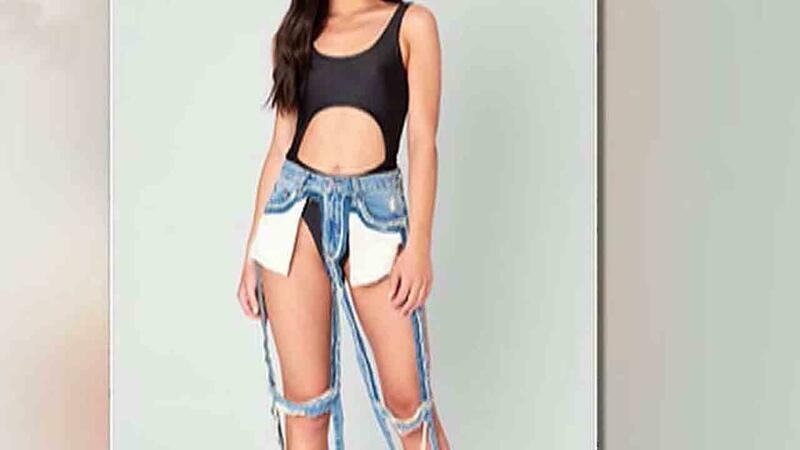 Crazy denim looks seemed to be all the rage in 2018, and this tiny jean “waist belt” was no exception. Unravel Project, the experimental streetwear label beloved by Gigi Hadid, Kim Kardashian and Rihanna, debuted its own take on the trend with this $405 item. Online retailer ASOS offered a pair of light wash, loose cut and totally backless women’s denim jeans, held up on the front of the thighs with silver chains, from The Ragged Priest. While the British brand’s risqué bottoms lack a traditionally essential element of pants, they’re priced at $125. Gucci debuted a sporty one-piece swimsuit that many fashionistas were bound to obsess over. But while the design itself isn’t that strange, the item’s description left people baffled: “Due to the nature of this particular fabric, this swimsuit should not come into contact with chlorine.” So while you can’t take this item for a dip in the pool, at least you’ll look nice lounging nearby…and it’ll only cost you $380. Wearing your shorts right-side-up is so last year. This year, upside-down shorts were the hot item to have. With a raw hem waist, inverted pockets and belt loops around the bottom, these $385 jorts from New York-based based brand Cie come in two different washes: the faded “Nancy” and the darker, more saturated “EL” — both references to characters from Netflix’s retro hit “Stranger Things.” And if shorts aren’t your thing, you could buy the pants version, instead. An entire collection of duct tape bikinis made their debut at Miami Swim Week in 2018. The stick-on swimwear in various metallic shades left little to the imagination. While it’s unclear whether a person could actually go swimming in these daring designs, if nothing else, they certainly look unique. Balenciaga did not disappoint in 2018. First came the designer’s take on Crocs, then came this peculiar “T-shirt shirt.” Part of the Fall 18 collection, this unique item features a blue short-sleeve T-shirt with a long sleeve blue checked button-up attached to the front. Anyone interested in sporting this get-up had to fork out $124. This year has seen its fair share of denim disasters. The lace-up pant is the latest in blue jean deconstruction that has people talking — and shaking their heads. Online retailer Fashion Nova released the Wild Thang lace-up jeans for a surprisingly affordable $49.99, and the extreme-cut jean, which boasts a quarter of the material, sold out.